The Ta 154 A-1 is a premium rank III German twin-engine fighter with a battle rating of 4.3 (AB/RB) and 4.0 (SB). It was introduced in Update 1.65 "Way of the Samurai". The Ta 154 A-1 is part of the revenue share program and is created by Vitaly "NovA29R" Vostokov (model) and Michael "__StrafeMike__" Ioannidis (texture). 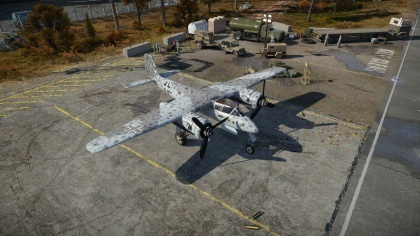 The Ta 154 A-1 has very powerful armament in the fuselage which can give you quick and easy kills. Unfortunately it doesn't turn very well at low speeds so it is recommended to keep your speed up and Boom & Zoom. Turning should be a last resort. If you try to get an edge in a turn-fight using your flaps, you should watch your speed as your flaps can break off very easily at speeds above 450 km/h (279 mph). 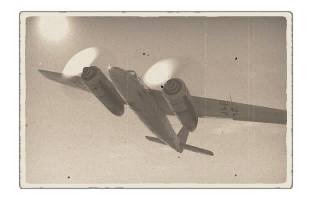 The roll-rate of the Ta 154 is almost as good as the Fw 190s roll-rate, this is due to the fact that there are no fuel tanks in the wings. This advantage can and should most definitely be used when flying evasively but when you're at low altitude do periodically check what's in front of you. This plane doesn't differ a lot from the Bf 109s and Fw 190s regarding usage of Manual Engine Settings. Prop pitch: unless you really know what you're doing, don't even dare to think about using it. Radiator: radiator can be set at 30% for a long time but will eventually have to be changed to 40-50% as the engines will start to overheat continuously. While this happens you will be forced to use WEP less as the match progresses unless you stop using MEC for quite a while or land and repair which will reset this. Exceptional armament (with decent ammunition count). Heavy armour and nose mounted 2 x 20 mm and 2 x 30 mm cannons are the perfect combo for head-on attacks. Agility comparable to a medium fighter. Interceptor spawn, gains altitude much faster than its opponents. Exceptional speed in a straight line. Low wing load gives the plane a good turn rate at higher speeds. Flaps break off easily at speeds above 450 km/h (279 mph). Turns horrible at low speeds. Can fly on 1 engine but only around 300 km/h (186 mph). Landing gears are very sensitive and will break when landing at speeds above 200 km/h (124 mph). Prolonged WEP can lead to engine problems.